The funeral of racing driver Henry Surtees, who was killed in a crash during a Formula Two race at Brands Hatch, has been held in West Sussex. 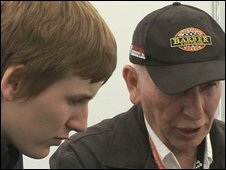 The driver was the son of ex-Formula One world champion John Surtees, who said his son had "followed his heart from the time he first sat in a kart". Surtees, 18, died from a head injury on 19 July, after a tyre from another car hit him at the Kent circuit. 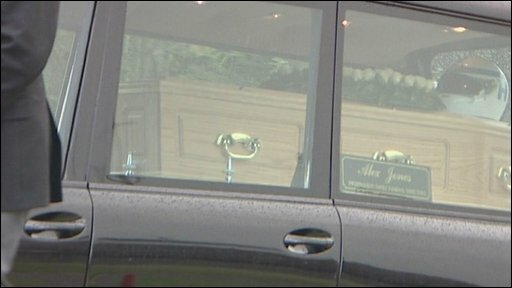 His coffin arrived at Worth Abbey near Crawley topped with a racing helmet. The teenager had just completed A-levels in economics, ICT and biology at Worth School, run by Benedictine monks from the Turners Hill Abbey. The school said he had been a popular and positive member of the sixth form who had succeeded in combining his studies with a busy racing schedule. He was just beginning a gap year before studying management at university. Surtees was knocked unconscious by the loose wheel from Jack Clarke's car while travelling at 120mph (193km/h). John Surtees, now 75, who lives in Lingfield, Surrey, won the F1 World Championship in 1964. He said: "The world beckoned and he was thriving on the freedom to concentrate on his motorsport. "He had shown himself to be one with the possibilities of reaching the very top." The coffin of Henry Surtees arrives at Worth Abbey.